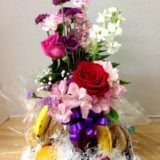 Lotsa fruit and flowers says it all! 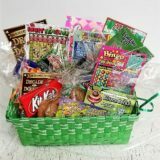 You can’t go wrong with this goodie gift basket filled with delicious fresh fruit of the season (such as apples, pears, oranges and grapes, and then we’ll add seasonal fruit as available!) Delish!! 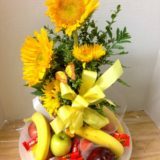 We’ll top it all off with a beautiful fresh floral arrangement that’s perfect for either a man or a lady, using the freshest flowers available in our store! 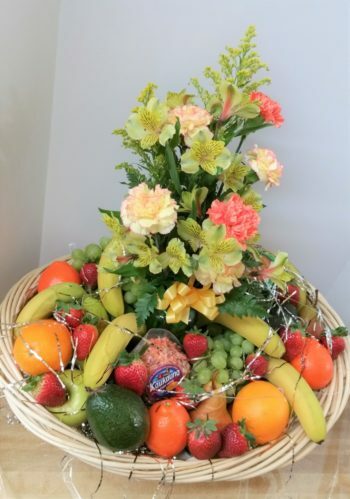 When you order Lotsa Fruit & Flowers, we hand-select the freshest fresh fruit of the season and load the basket from bow to stern! 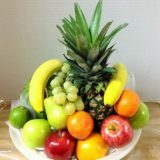 Well, not really, it’s not a boat, but it’s a loaded basket with at least 18 pieces of fruit! Perfect for grab-and-go, too! This is great for an office where people are busy and would walk by, grab a snack and move on! 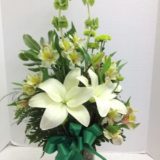 Topping this off with an arrangement of fresh flowers guarantees festivity and smiles. 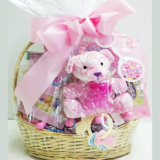 Designed appropriately for the occasion, the more you tell us about the recipient, the more custom we can make this terrific gift! 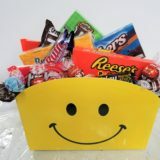 Here’s another great option for you, designed by Basket Express! 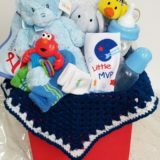 Check out our That’s a Hat Basket!